Make the dressing by mixing the oil, cider vinegar, horseradish and sugar in a clean jar. Seal and shake vigorously, then set aside. Very finely slice half the lemon. and lay on a roasting tray. Reserve the other half of lemon for later. Rub the sardines all over with butter and season the skin very lightly with salt. Put pepper on the flesh side. Carefully place the fish, cut side down, on top of the sliced lemons and set aside. Heat a small saucepan over a medium heat and add the beer. When the beer starts bubbling and is about to start evaporating, pop in the crab meat and gently swirl the pan. 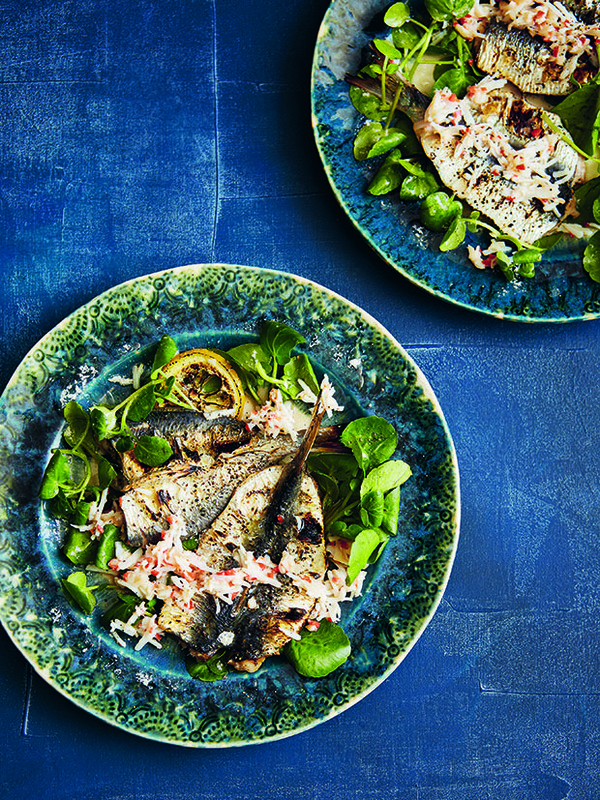 As the crab meat is gently heating, place the sardines under the grill until they are golden and crispy skinned. Turn off the grill and leave them in the bottom of the oven to rest. Take the crab meat off the heat and allow to cool a little. Stir the chilli and garlic gently into the beery crab meat, then add just enough of the yoghurt to bind it together. Check for seasoning and adjust accordingly. Place the watercress in a large bowl, drizzle with the dressing, then divide between the plates. Top with the sardines and a few roasted lemon slices. Dress with the crab mixture and finish with a squeeze of lemon juice. Recipe is extracted from The Beer Kitchen by Melissa Cole, Published by Hardie Grant. Buy the book here.